Arthritis of the elbow has many causes, and there are many ways of treating the pain. These treatments can be very successful, at least for a while. But eventually the elbow can become so painful that nonsurgical treatments don't work anymore. At this point, your doctor may recommend surgery to fuse the elbow. 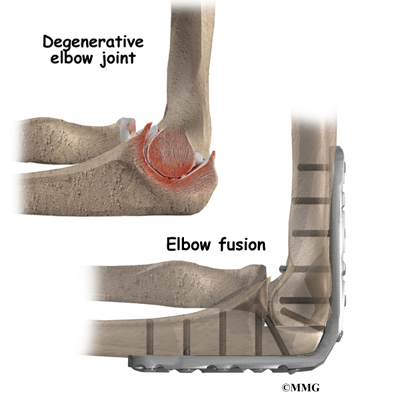 Elbow fusion may also be necessary after severe trauma to the elbow. Fusion surgery is sometimes called arthrodesis. The elbow joint is made up of three bones: the humerus bone of the upper arm, and the ulna and radius bones of the forearm. The ulna and the humerus bones meet at the elbow to form a hinge. This hinge allows the arm to bend and straighten. The connection of the radius to the humerus allows rotation of the forearm. The upper end of the radius is round. It turns against the ulna and the humerus as the forearm and hand turn from palm down (pronation) to palm up (supination). When the articular cartilage is worn away over time, the bones begin to rub against each other. This causes the pain of degenerative arthritis. Degenerative arthritis is also called osteoarthritis. Why do I need elbow fusion surgery? A fusion of any joint eliminates pain by making the bones of the joint grow together, or fuse, into one solid bone. Fusions are used in many joints. They were very common before the invention of artificial joints. Fusions are still performed fairly often to treat arthritis pain. An elbow fusion helps get rid of pain because the bones of the joint no longer rub together. Advanced arthritis can change the alignment of the elbow, leading to deformity. Likewise, elbow injuries can alter normal alignment and eventually produce arthritis. Fusing the bones together improves the alignment and prevents further deformation. You will not be able to bend your elbow after fusion surgery. 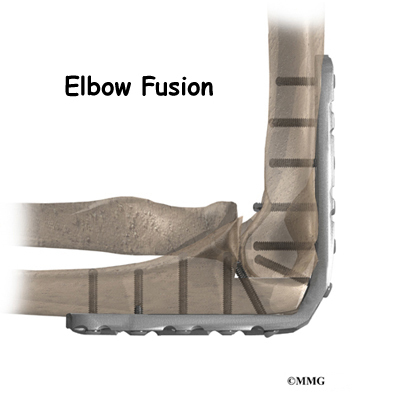 An elbow fusion is a tradeoff. You will lose the hinge motion in your elbow, but you will regain a strong, pain-free elbow joint. Regaining strength is especially important to laborers who work with their arms and hands. Some patients may need range of motion more than strength. In these cases, doctors usually recommend surgeries such as interposition arthroplasty or elbow joint replacement. The radius bone of the forearm is usually not part of the elbow fusion. 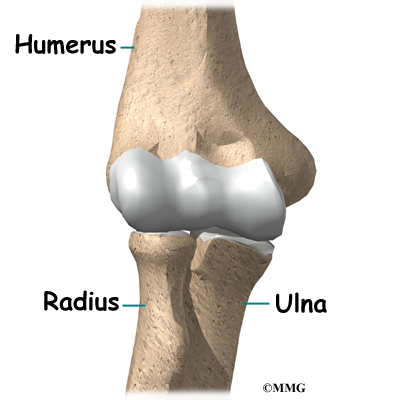 The end of the radius forms a joint with the ulna. This joint allows you to pronate and supinate (rotate) your forearm and hand. When this joint is a source of pain, the surgeon may remove the round end of the radius near the elbow. This still allows the forearm to rotate. On the day of your surgery, you will probably be admitted to the hospital early in the morning. You shouldn't eat or drink anything after midnight the night before. The amount of time patients spend in the hospital varies. What happens during elbow fusion surgery? There are many different types of operations to fuse the elbow. Most of the procedures are designed to remove the articular cartilage from the joint surfaces of the hinge joint and then bind the two surfaces together until they heal. When two raw bone surfaces are held together like this, your body treats them like a broken bone. New bone forms to heal the two pieces together. When the fusion is healed, a strong, solid connection between the humerus and ulna will have replaced the painful arthritic joint. 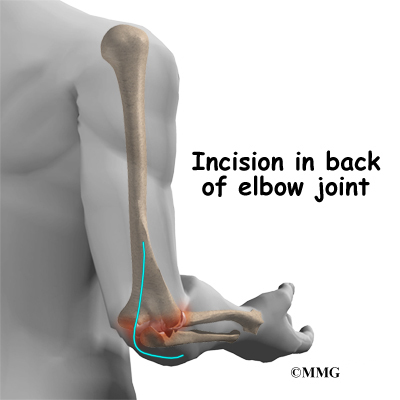 The first step in an elbow fusion is an incision down the back of the elbow. The incision is made on the back side because most of the blood vessels and nerves are on the inside of the elbow. Entering through the back of the elbow makes them less likely to be damaged. The surgeon then moves the tendons and ligaments to the side to expose the joint surfaces. Care must be taken to protect the nerves that run beside the elbow joint on their way to the hand. 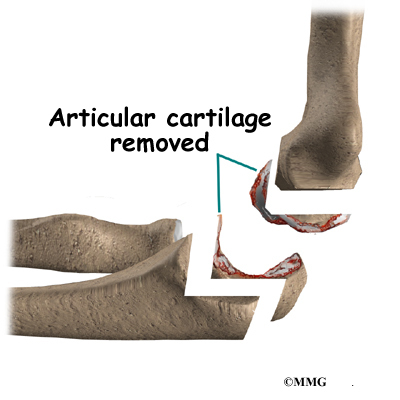 The surgeon then removes the articular cartilage surface of each side of the joint. The surgeon must then fix the humerus and ulna in place until they can heal together. The elbow is bent to 90 degrees and the bones are carefully aligned. The bones must be properly aligned and immobilized for fusion to occur. There are different ways of holding the bones together. Many surgeons place a metal plate with screw holes onto the back of the elbow, from the humerus to the ulna. The metal plate is attached to the bone with metal screws. The metal plate stays in the arm permanently. It is only removed if it causes problems. Another way to hold the bones together is to use an external fixator. 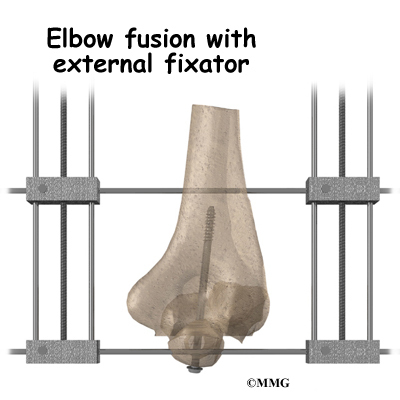 Surgeons sometimes choose an external fixator if there have been problems with an infection in the elbow joint. An external fixator involves placing metal pins through the bones above and below the elbow joint. Your surgeon may also place a metal screw inside the ulna and humerus to pull the bones together. The external fixator device is then placed on the elbow outside the skin, after the incision is sewn up. The external fixator attaches to the metal pins, which come through the skin, with metal rods and bolts. At the end of the fusion operation, the incisions are sutured together. As long as you don't have an external fixator, the arm is placed in a large splint or cast. It usually takes about 12 weeks for the fusion to become solid. At this point the metal pins and rods of the external fixator are removed. Does elbow fusion surgery cause any problems? Any surgery carries the risk of infection. You will probably be given antibiotics before the procedure to reduce the risk. If you get an infection, you will need more antibiotics. If the area around the bone graft or metal plate becomes infected, you may need surgery to drain the infection. All of the nerves and blood vessels that go to the forearm and hand travel across the elbow joint. Because the operation is performed so close to these nerves and vessels, it is possible to injure them during surgery. When the damage is caused by retractors used during surgery to stretch them out of the way, the nerve symptoms are usually temporary. Permanent injury to the nerves or blood vessels rarely happens, but it is possible. Sometimes the bones do not fuse as planned. This is called a nonunion, or pseudarthrosis. (The term pseudarthrosis means false joint.) If joint motion from a nonunion continues to cause pain, you may need a second operation. In the second procedure, the surgeon usually adds more bone graft and checks that the plates and screws are holding the bones solidly in place. The bones need to be completely immobilized for fusion to occur. After surgery, you will either wear an external fixator for up to 12 weeks or a long-arm cast for about six weeks. Both devices hold the elbow still while the ends of the bones fuse together. Your surgeon will want to check your elbow within five to seven days. Stitches will be removed after 10 to 14 days, although most of them will have been absorbed by your body. You may have some discomfort after surgery. Your surgeon can give you pain medicine to control the discomfort. You should keep your arm elevated above the level of your heart for several days to avoid swelling and throbbing. Keep it propped up on a stack of pillows when sleeping or sitting. Patients who have an external fixator should expect to wear it for up to 12 weeks. When a cast is used, some doctors will replace it with a removable splint after six to eight weeks. If you wear a cast, the joints in your wrist and fingers may feel stiff or sore. Your surgeon will X-ray your elbow several times after surgery to make sure that the bones are healing properly. Once your surgeon is sure that fusion has occurred, you can safely begin a strengthening program. It will take some time to regain the strength in your arm. As with any surgery, you need to avoid doing too much, too quickly. If you keep having pain or find that you have stiffness in the shoulder, wrist, or finger joints, you may need a physical or occupational therapist to direct your recovery program. The first few therapy treatments will focus on controlling the pain and swelling. Your therapist may use gentle massage and other types of hands-on treatments to ease muscle spasm and pain. Then you'll begin gentle range-of-motion exercises for the arm. Strengthening exercises give you added stability around the elbow joint. Some of the exercises you'll do are designed to get your arm working in ways that are similar to your work tasks and daily activities. Your therapist will teach you ways to use your arm so that you can do your tasks safely and with the least amount of stress on your elbow. Before your therapy sessions end, your therapist will teach you a number of ways to avoid future problems. Your therapist's goal is to help you keep your pain under control, improve your strength, and learn how to adjust your activities to avoid putting too much strain on your arm and elbow. When you are well under way, your regular visits to the therapist's office will end. Your therapist will continue to be a resource, but you'll be in charge of doing your exercises as part of an ongoing home program.